Below is cowboy canvas wall art for sale on Amazon.com. You will find canvas artwork from David Stoeckein, Frederic Remington, and more. Please scroll down for more information on canvas wall art. You might also like Horse Canvas Wall art and Custom Canvas Wall Art. 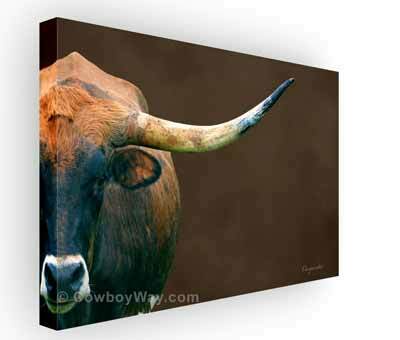 Below: A Longhorn cow on gallery wrap wall art. Please note: While most of the artwork below is canvas wall art, some of it is not. Please check the item's description carefully to make sure it is canvas wall art. Below is canvas wall art featuring cowboy or Western scenes for sale on Amazon and eBay. Our proprietary canvas provides a classic and distinctive texture. It is acid free and specially developed for our giclee print platforms. Each premium canvas gallery wrap finished with a closed back preventing dust collection inside the back of the wrap. The back includes a pre-installed, ready-to-hang sawtooth hardware. Our stylish framed wraps also come with pre-installed hanging hardware built into the frame, along with felt protective bumpers. Canvas wall art is what is sounds like: Art work on canvas suitable for displaying on a wall. Some canvas wall art, however, is a bit different. While it is still artwork on canvas, it might also be what is commonly called "canvas gallery wrap," "gallery canvas wrap," or simply "gallery wrap" art. Gallery wrap is a way of stretching painted or printed canvas around wooden or plastic bars so that the bars are entirely covered and therefore invisible to the viewer. This gives the artwork an attractive depth, like a shallow box, with the sides usually being a continuation of the image (either an actual continuation, or a shallow reflection of the art as it approaches the sides). If the sides are not a continuation of the image they are typically a solid color that compliments the art. The thickness of the sides of canvas wall art varies, but somewhere between 1/2 inch to 1 3/4 inches is common. With gallery wrap a frame and/or matting is not necessary or used. Gallery wrap art provides a clean, attractive, look whereby the viewer's attention is drawn solely to the art. The texture of the canvas contributes a gently textured, realistic look to the image. Gallery wrap art is typically very lightweight making it easy to hang almost anywhere, including areas where conventional framed artwork would be too heavy. In addition, since the canvas is stretched over the front and sides of the hidden bars beneath, but not the back, the back of the gallery wrap is hollow. This allows it not only to be hung on smooth walls, but also on walls that have blemishes that might cause framed artwork to bulge or hank crooked. The hollow back of the gallery wrap also allows it to cover other items on a wall that may not be aesthetically pleasing, such as a breaker box. If you find a piece of canvas wall art for sale that you like but you're not ready to purchase it right away, you can always add it to your shopping cart so it will be easy to find later. In most cases, Amazon will keep track of your wall art, and anything else in your shopping cart, for 90 days. In the meantime, if you want to check out with other items, click "Save for later" to move the cowboy art to a separate, but still easy-to-find list beneath your shopping cart.